In this guide we will show you how to add Login with Amazon to your Android app, using the Login with Amazon SDK for Android. After completing this guide you should have a working Login with Amazon button in your app that allows users to login with their Amazon credentials. To learn more about the login flow your customers will experience when they use Login with Amazon within your app, please see our Customer Experience Overview for Android apps. Install the Android Studio Bundle from developer.android.com. Ensure your Android application has a minimum SDK Version of Android 3.0 (API Level 11) or higher, or a Minimum SDK Version of Android 2.2 (API Level 8) or higher with the v4 Android Support Library. The Login with Amazon SDK for Android comes in two packages. The first contains the Android library and supporting documentation. The second contains a sample application that allows a user to login and displays their profile data. Download LoginWithAmazonSDKForAndroid.zip and extract the files to a directory on your hard drive. You should see a doc and a lib subdirectory. Double-click doc/index.html to view the Login with Amazon Android API Reference. Start AndroidStudio and select Open an existing Android Studio project. Before you can use Login with Amazon on a website or in a mobile app, you must register an application with Login with Amazon. Your Login with Amazon application contains information about your business, and information about each website or mobile app you create that supports Login with Amazon. This business information is displayed to users each time they use Login with Amazon on your website or mobile app. Users will see the name of your application, your logo, and a link to your privacy and information about each website or mobile app you create that supports Login with Amazon. These steps demonstrate how to register your Android app for use with Login with Amazon. In the App Console register a new application by clicking the Register new Application button. Note: You will be redirected to Seller Central, which handles application registration for Login with Amazon. If this is your first time using Seller Central, you will be asked to set up a Seller Central account. In the Register Your Application form, you must enter a Name and a Description for your application. The Name is displayed on the consent screen when users agree to share information with your application. This name applies to Android, iOS, and website versions of your application. The Description helps you differentiate each of your Login with Amazon applications and is not displayed to users. If you want to add a Logo Image for your application, click Browse. This logo is displayed on the consent screen when users log into your website or mobile app. The logo will be automatically resized to 50 x150 pixels. The following formats are accepted: PNG, JPEG, GIF. To register an Android App, you have the choice of registering an app through the Amazon Appstore or directly with Login with Amazon. Once your app is registered you will have access to an API key that will grant your app access to the Login with Amazon authorization service. The email address of the Amazon account you used to sign up for Login with Amazon. The email address of the Amazon account you used to sign up for the Amazon Appstore (if different). The name on your Seller Central account (in Seller Central, click Settings, Account Info, Seller Information, and use the Display Name). The name on your Amazon Appstore developer account (in the Mobile App Distribution site, click Settings, Company Profile and use the Developer Name or Company Name). Select Yes to the question "Is this application distributed through the Amazon Appstore?" Enter the Label of your Android App. This does not have to be the official name of your app. It simply identifies this particular Android app among the apps and websites registered to your Login with Amazon application. Add your Amazon Appstore ID. If you self-signed your app, add self-signing information. This will allow you to obtain an API key during development without using the Appstore directly. Enter your Package Name. This must match the package name of your Android project. To determine the package name of your Android Project, open the project in your choice of Android developer tool. 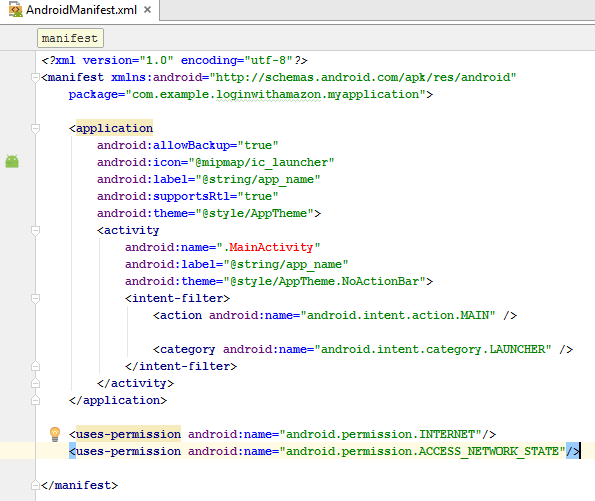 Open the AndroidManifest.XML in Package Explorer and select the Manifest tab. The first entry is the Package name. Enter the app Signature. This is a SHA-256 hash value used to verify your application. The signature must be in the form of 32 hexadecimal pairs separated by colons (for example: 01:23:45:67:89:ab:cd:ef:01:23:45:67:89:ab:cd:ef:01:23:45:67:89:ab:cd:ef:01:23:45:67:89:ab:cd:ef). See Android App Signatures for steps you can use to extract the signature from your project. Select No to the question "Is this application distributed through the Amazon Appstore?" If different versions of your app have different signatures or package names, such as for one or more testing versions and a production version, each version requires its own API Key. From the Android Settings of your app, click the Add API Key button to create additional keys for your app (one per version). The app signature is a SHA-256 hash value that is applied to every Android app when it is built. Login with Amazon uses the app signature to construct your API Key. The API Key enables the Login with Amazon authorization service to recognize your app. If you use the Amazon Appstore to sign your app, the API key is provided automatically. If you are not using the Amazon Appstore, you will need to manage your API key manually. A release keystore is normally created when you export your Android application to create a signed APK file. Through the export process, if you are creating a new release keystore you will select its location. By default it will be placed in the same location as your default debug keystore. Under Certificate Fingerprints, copy the SHA256 value. Once you have registered an Android setting and provided an app signature, you can retrieve the API key from the registration page for your Login with Amazon application. You will need to place that API key into a file in your Android project. Until you do, the app will not be authorized to communicate with the Login with Amazon authorization service. On the Applications box at left, select your application. Find your Android app under the Android Settings section. If you have not registered an Android app, see Adding an Android App for Amazon Appstore. Click Generate API Key Value. A popup window will display your API key. To copy the key, click Select All to select the entire key. Note: The API Key value is based, in part, on the time it is generated. Thus, subsequent API Key value(s) you generate may differ from the original. You can use any of these API Key values in your app as they are all valid. In this section, you will learn how to create a new Android project for Login with Amazon, configure the project, and add code to the project to sign in a user with Login with Amazon. We will be describing the steps for Android Studio, but you can apply analogous steps to any IDE or Android development tool of your choice. This guide requires an understanding of Activities - a key concept of Android application development. Learn more about Activities and Activity Fragments on developer.android.com. If you do not yet have an app project for using Login with Amazon, follow the instructions below to create one. If you have an existing app, skip to Install the Login with Amazon Library. From the File menu, select New and Project. Enter an Application Name and Company Name for your app. Enter the Application and Company Name corresponding to the package name that you chose when you registered your app with Login with Amazon. If you haven't registered your app yet, choose a Package Name and then follow the instructions in the Register with Login with Amazon section above after you create your project. If the package name of your app does not match the registered package name, your Login with Amazon calls will not succeed. Select a Minimum Required SDK of API 11: Android 3.0 (Honeycomb) or higher, and click Next. You can alternately use a Minimum Required SDK of API 8: Android 2.2 (Froyo) or higher when using the v4 Android Support Library. Select the type of activity you want to create and click Next. Fill in the relevant details and click Finish. You will now have a new project in your workspace that you can use to call Login with Amazon. If you have not yet downloaded the Login with Amazon SDK for Android, see Install the Login with Amazon SDK for Android. Using the file system on your computer, find the login-with-amazon-sdk.jar file within the Login with Amazon SDK for Android. Copy it to the clipboard. With your project open in Android Studio, open the Project View. Right-click on the parent directory for your project/app in the Project View and select Paste. Right-click the login-with-amazon-sdk.jar file in the Project View and select Add as Library. In order for your app to use Login with Amazon, it must access the Internet and access network state information. Your app must assert these permissions in your Android manifest, if it doesn't already. From the Project View, double-click AndroidManifest.xml to open it. When you register your Android application with Login with Amazon, you are assigned an API key. This is an identifier that the Amazon Authorization Manager will use to identify your application to the Login with Amazon authorization service. If you are using the Amazon Appstore to sign your app, the Appstore will provide the API key automatically. If you are not using the Amazon Appstore, the Amazon Authorization Manager loads this value at runtime from the api_key.txt file in the assets directory. If you do not have your API Key yet, see Android App Signatures and API Keys under Register with Login with Amazon and follow the instructions under "Retrieving an Android API Key". With your ADT project open, in the File menu, click New and select Untitled Text File. You should now have an editor window for a text file named Untitled 1. Add your API key to the text file. In the Save As dialog, select the assets directory of your project as the parent folder. For File name, enter api_key.txt. If a user changes the screen orientation or changes the keyboard state of the device while they are logging in, it will prompt a restart of the current activity. This restart will dismiss the login screen unexpectedly. To prevent this, you should set the activity that uses the authorize method to handle those configuration changes manually. This will prevent a restart of the activity. In Package Explorer, double-click on AndroidManifest.xml. 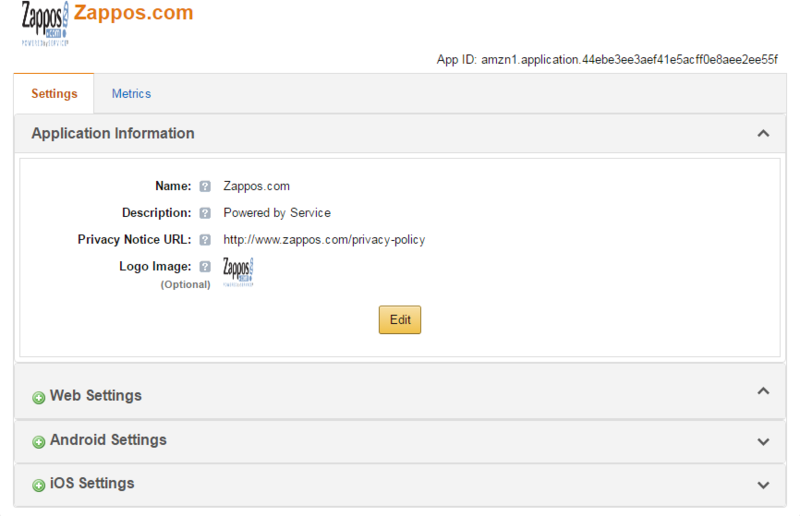 In the Application section, locate the activity that will handle Login with Amazon (for example, MainActivity). Now, when a keyboard or device orientation change happens, Android will call the onConfigurationChanged method for your activity. You do not need to implement this function unless there is an aspect of these configuration changes that you want to handle for your app. When the user clicks the Login with Amazon button, the API will launch a web browser to present a login and consent page to the user. In order for this browser activity to work, you must add the WorkflowActivity to your manifest. If you have previously integrated with the Login with Amazon SDK or you have the com.amazon.identity.auth.device.authorization.AuthorizationActivity activity declared in your AndroidManifest.xml, it must be removed and replaced with the WorkflowActivity. Note: If you are not using the Gradle build system, replace with your package name for this app. Login with Amazon provides several standard buttons that you can use to prompt users to log in from your app. This section gives steps for downloading an official Login with Amazon image and pairing it with an Android ImageButton. Add a standard ImageButton to your app. For more information on Android buttons and the ImageButton class, see Buttons on developer.android.com. Consult our Style Guidelines for a list of buttons you can use in your app. Download a copy of the LWA_Android.zip file. Extract a copy of your preferred button for each screen density your app supports (xxhdpi, xhdpi, hdpi, mdpi, or tvdpi). For more information on supporting multiple screen densities in Android, see Alternative layouts in the "Supporting Multiple Screens" topic on developer.android.com. Copy the appropriate button image files to your project. For each screen density you support (xhdpi, hdpi, mdpi, or ldpi), copy the downloaded button to the res/drawable directory for that screen density. Load your app, and verify that the button now has a Login with Amazon image. You should verify the button displays properly for each screen density you support. Add Login with Amazon to your Android project. See Install the Login with Amazon Library under Create a Login with Amazon Project. Note: If you’re using a fragment and capturing references to View objects in your AuthorizeListener implementation, create AuthorizeListener in the onCreateView method instead of onCreate. This ensures the View object references are set when the call to authorize finishes. Because the authorization process presents a login screen (and possibly a consent screen) to the user in a web browser (or a WebView), the user will have an opportunity to cancel the login or navigate away. If they explicitly cancel the login process, onCancel is called, and you will want to reset your user interface. The secure context for the second option is available when the Amazon Shopping app is installed to the device. Amazon- created devices running Fire OS (for example Kindle Fire, Fire Phone, and Fire TV) always use this option even if there is no Amazon Shopping app on the device. Because of this, if the user is already signed in to the Amazon Shopping app, this API will skip the sign in page, leading to a Single Sign-On experience for the user. See Customer Experience in Android/Fire apps to learn more about the customer experience when using Login with Amazon. This section explains how to use the signOut method to log the user out of your app. The user will have to login again in order for the app to retrieve profile data. Use this method to log out a user, or to troubleshoot login problems in the app.